The largest chunk of Medicaid spending goes to the blind or disabled. They aren’t being shiftless or lazy. Nor are the elderly. Nor are children. 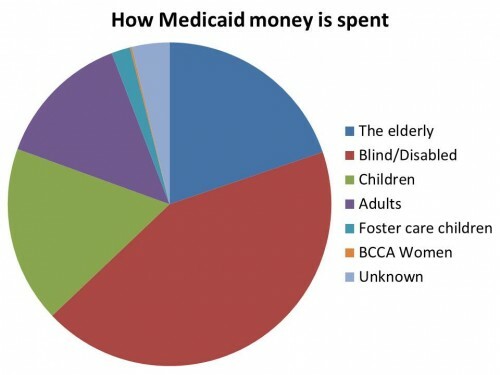 Adults make up a rather tiny portion of Medicaid spending, and it’s important to remember that lots of them are pregnant women. Medicaid covers one third of births in the United States. If we cut people from Medicaid, what are these groups to do? Should the disabled earn more to buy private insurance? Should the elderly? Should children? Should pregnant women? What’s with the “Unknown” section? >> What’s with the “Unknown” section?